Children are told to “go outside and play.” That’s so they don’t strangle the cat, smear chocolate on the linoleum, and adults don’t fall over them. It’s also to get them away from the lure of television and game consoles, which were invented to hypnotise children. But “go outside and play” trips off the tongue more readily than “come inside and play,” or play in the garage, toolshed or the Landrover. It’s probably safer too, though outside is best thought of as a garden, an enclosed safe area, if you are lucky enough to have one. In fact the model of the outdoors that people favour is not some untrammelled wilderness, but the safer, in-between zone betwixt inside and really “out there” (the wild, elusive, pre-inhabited natural other, that probably doesn’t exist). “incorporating elements of masquerade, chinoiserie, and other exotic fantasies that transported visitors to new realms of fancy. Promenading along their shaded walks of a summer evening, visitors could escape the pains of the city while still enjoying its pleasures. Sudden contrasts of light and dark, familiar and strange, pleasure and danger that would have seemed deeply unsettling anywhere else became a source of excitement and wonder” (1). For people brought up in temperate climates the natural world at its best presents as bucolic, a vast parkland of pleasure and play. I’ve written about play before, and referenced the famous book by Johan Huizinga, Homo Ludens. In that book he says a lot about play, but nothing about gardens or nature. I think that play serves as a useful conceptual intermediary between digital technologies and nature (a growing interest of mine). To ask how smartphones and other mobile media assist or hinder our relationship with the natural environment is to ask how they help or hinder play. Technologies inevitably come into play in this place making. DeNora says, “If play is engagement with the world, then the features of the world can be understood in the broadest sense as toys” (43). She doesn’t assert this (but it’s something to conjure with): perhaps the artefacts we urbanites carry with us when we go outside and play are as much a part of the “outdoors” as the trees, flowers, mud and sunshine. Also see posts tagged play. 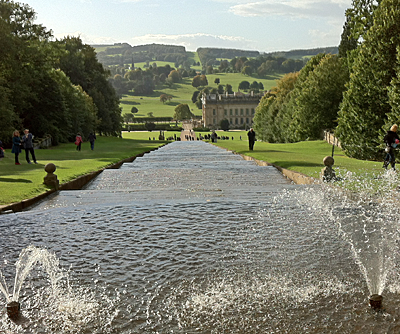 The first image in the article is Chatsworth House Gardens in Derbyshire England. Lancelot “Capability” Brown had a hand in the design (re-design) of the gardens in the 1750s. 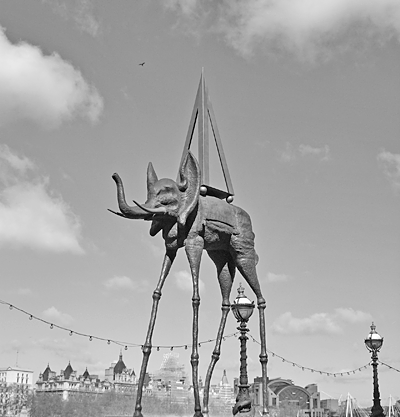 The second is of one of several sculptures erected along the Thames Southbank in London to promote an exhibition of Salvador Dali’s work in 2010. This is at Jubilee Gardens where the London Eye is located, about a mile down river from the site of Vauxhall Gardens. Richard, “Go outside and play” phrase triggered several memories for me. While in the US, we tend to have “yards” – enclosures of grass – for playing, my brothers and I were in the woods most of the time, climbing trees, swinging on wild grapevines and other very active mischief. Playing for us was very much like a “Little Rascals” movie with an intact “kid culture” completely separate from adult society – I wonder if the concept of playing explores that difference or if technology inherently ties children into the adult world. The other childhood memory is that somehow, our family television broke down at the beginning of every summer; we quickly ignored it and spent most of our waking hours outside. Years later, my parents confessed that they simply unplugged the set and we never questioned them. In Melbourne we had backyards — more generous than in the UK, and a climate that encouraged going out to play just about all year round, except when the hot north wind blew in the summer. This picture is local to Edinburgh, showing yards, a lane, and allotments — play spaces for grown ups when the sun shines.